This is a conflation of “let sleeping dogs lie” (leave something alone that might cause trouble) and I think “don’t beat a dead horse” (don’t waste time doing something that has already been attempted). When you mix dogs with horses, and sleeping with lying and dying, you get this malaphor. 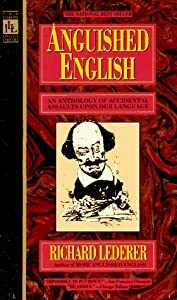 This one comes from Richard Lederer‘s Anguished English: An Anthology of Accidental Assaults Upon the English Language, rev. ed. Wyrick, 2006. “Let the dead sleep (rest) in peace.” No dogs. No horses. No possums. I like ’em too, but ever hear of “playing possum”? OK, how about a dead parrot instead?